Mekong Highlight Tour is perfect holidays to the south of Vietnam with natural beauties of the mighty Mekong river by visiting floating markets, peaceful villages, rice paddies, fruit orchard and also learning great cultural & historical Saigon. Ho Chi Minh & Mekong Delta Tour Package is perfect holidays to the south of Vietnam with natural beauty of the mighty Mekong by visiting Cai Rang floating markets, peaceful villages, rice paddies, fruit orchards and also great cultural & historical Saigon with remarkable sites: Cu chi tunnels, the great Cao Dai Temples. To learn the long history of Saigon at Reunification Palace, gorgoeous church, interesting museum awaiting for your discovery. You will be inspired unforgettable experiences with 6 days tour. Contact us to get best hotel matching your budget, upgrade hotel from us for this private tour..
Tourguides: All Tourguides or Tour escorted are local people who take you to all destionations that meantions in program! Breakfast at the hotel. Start your sightseeing tour at the Reunification Palace, which was the residence of the President of South Vietnam until end of the war in April 1975. Then visit some impressive French colonial structures including Notre Dame Cathedral and the Old Central Post Office. Explore Chinatown and Thien Hau and Quan Am pagodas. After seeing the Emperor Jade Pagoda and the War Remnants Museum, end your tour at Ben Thanh market where anything and everything is for sale. Dinner on guest’s account. Overnight at your chosen hotel in HCMC. 8:00 AM Pick up at your hotel in HCMC. Depart for My tho. Take a leisurely boat ride through the Bao Dinh natural canal which is bordered by rows of traditional stilt houses and fruit plantations. Visit the My Tho wholesale fruit market. Proceed to Tortoise island. Lunch served in the heart of the orchard. Enjoy a boat ride through the Tan Thach natural canal in Ben Tre, cruising under the shadows of the water coconut trees. Visit a family business which epitomizes the idyllic rural lifestyle. After trekking through the fruit plantation on Thoi Son island, enjoy a rowing boat ride along the creeks before returning to My Tho by motor boat. Proceed to Can Tho. Have a dinner at local restaurant. Overnight at your chosen hotel in Can Tho. 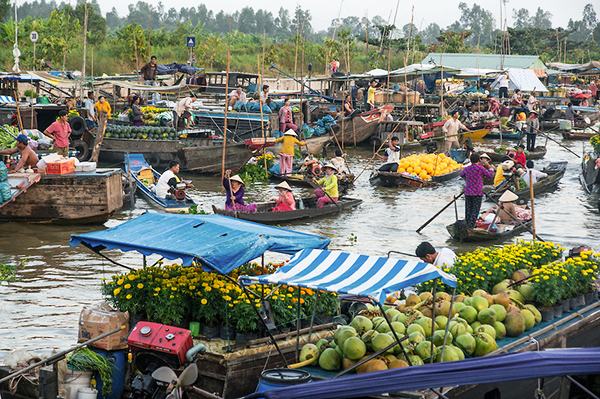 After breakfast, take the morning boat trip to visit the Cai Rang floating market which is at its busiest at this time of day. Keep cruising through the small channels system and visit a rice noodle making village. Break for lunch on the way back to Ho Chi Minh City. Breakfast at the hotel. Drive west to Tay Ninh, headquarters of Cao Dai region. On arrival, attend the fantastic mid-day temple service when followers fill the hall wearing colored robes, a symbol of the curious combination of Confucianism, Taoism and Buddhism. On the way back, visit the Cu Chi Tunnels, an underground network of tunnels constructed by Vietnamese fighters during the struggle for independence. The tunnels contained hospitals, accommodation, etc. and were used as a military base for the Vietcong during the American war. Return to HCMC. Having dinner at local restaurant. Overnight at your chosen hotel in HCMC. Having breakfast at the hotel. Transfer to the airport for departure. We can arrange additional customized trips for you if the above itinerary does not match your expectations. What do you think of Ho Chi Minh & Mekong Delta Tour Package 6 days/ 5 nights?